How do you use tech on the weekend? A good weekend for me is one where time seems to move more slowly. But given constantly updating feeds and news notifications using any tech on the weekend feels chaotic. I try to follow the philosophy that no tech is the best tech, but it’s not practical to stay away completely. So I end up changing how I use tech on the weekend compared to how I use it on weekdays – both in terms of which apps and services I use and how often I use them. And I find that my weekends are better because of this. Twitter: it represents most of my social media consumption and I find that cutting it out on the weekend lets me focus on the weekend. Twitter is hilarious, informative and educational, but looking at it makes my brain feel as if it’s in perpetual Fast-Forward. I don’t mind this during the week since I’m already in overdrive for work, but looking out my window on a Sunday puts me in a better mood than looking at Twitter does. Instagram: it’s my number two social media app and it doesn’t put my mind in overdrive quite like Twitter does. But, for me at least, it can swallow up a lot of time before I even realize. Scrolling through photos of my friends, favorite artists and athletes is a lot of fun, but before I know it 45 minutes have passed and I’m not even sure whose photos I’m viewing anymore. This isn’t necessarily a bad thing! Getting lost in something and not feeling the need to be constantly productive is very liberating. But I let it get excessive to the point where it’s not even fun so I just cut it out on the weekends. If I can’t avoid tech, there are some apps that are better for my weekend mindset and help me maintain peak-chill. 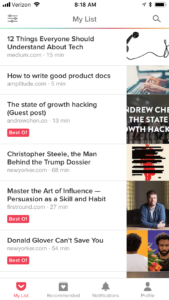 Apple News: I wrote about it at length – Apple News is a go-to when I’m hankering for news and gratification that an infinite scroll brings…without all the noise. 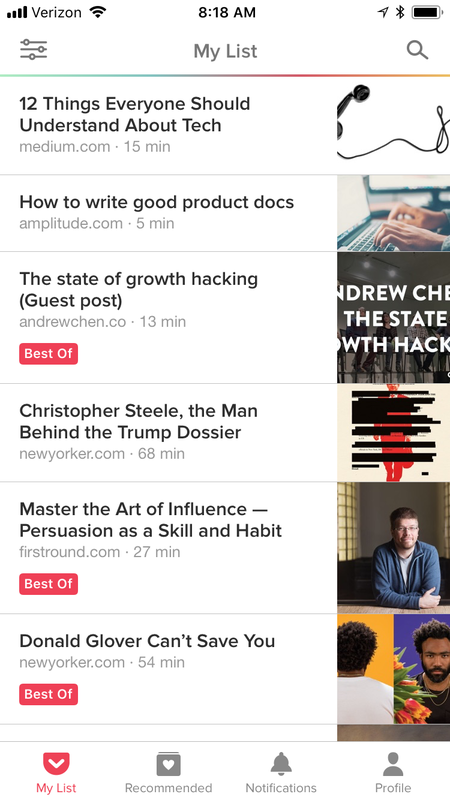 Pocket: I also wrote about Pocket and it’s perfect for the weekend when I have some time to catch up on long reads I’ve saved. I’m in rapid information-processing mode on weekdays, but on the weekend I have time to dig into things and Pocket lets me do this with articles. Sometimes you just have to put your phone in the other room and go it alone. I find old-fashioned newspapers perfect for the weekends where I have free time and want some light entertainment. NYT/WSJ Weekend Edition: At $5-$6 per paper, this may seem like a lot to spend, but have you seen how big these editions are? There’s gotta be at least 3 hours of entertainment in these papers and I never regret my purchase. So how do you use tech on the weekend? Does your app usage change from the weekday to the weekend? Apple News Saves the Day? It’s an aggregator so one can find many news sources all in one spot – I have tremendous respect for outlets like WSJ, NYT, WaPo (and have their respective apps installed), but an aggregator is more time efficient. I see headlines from the likes of Politico, Fox News and The New Yorker, so I feel I’m getting a representative collection of viewpoints out there(no matter how much you agree or disagree ;-). There seems to be some sort of ‘approval’ process to become a Publisher and I’m going to assume you won’t see any articles from Heart of Texas and Being Patriotic, two Facebook groups that posted heavily about the 2016 election and were ultimately found to be created by our Russian friends. The fact that there’s no social component to Apple News gives me most hope about fighting fake news and false information. So even if some questionable ‘publications’ do make it onto the App, there’s no chance that your crazy Uncle would amplify the articles by sharing. I probably get most of my news from Twitter and I love the timeliness that comes with so many individuals contributing to the platform, but it gets exhausting and overwhelming(Kanye, anyone?). Apple News updates only when there are new articles — there are no hot takes or ugly Twitter fights; it’s actually quite refreshing! Author adminPosted on May 10, 2018 May 14, 2018 Tags AppleLeave a comment on Apple News Saves the Day? While the App Store was due for a change, I think the future of App discovery is the OS and not another App. I can’t remember the last time I downloaded an App just from browsing the App or Play Store. Yes, one has to go to the Store to download an App (for now), but you probably came to the store because you heard about this App from someone/somewhere else or there’s a specific action you’re trying to complete. Now this second part is where I think the opportunity exists. App Discovery should be contextual. In a recent post on Notifications, Scott Belsky wrote about a ‘Notification Layer API‘ that “would take all kinds of data into account, like your location, your schedule, your propensity to engage with certain apps at certain times…” to make the Notifications you receive smarter. I propose this, but for App Discovery.